The whole idea behind drones is that they fly free. Unattached to the traffic-clogged, obstacle-riddled surface, they promise to change the way we move our stuff and even ourselves. So it’s strange to hear that one startup thinks the best way to fly drones is by tying them to the ground. That kind of flight time may not matter when hauling burritos, but it can make drones significantly more useful for the military and first responders likely to use drones as “instant towers.” They want aircraft that can hover over a given spot, providing them a birds-eye view or relaying radio and cell signals. The longer they can stay airborne, the better. And as a bonus, that tether can double as a transmission line, moving data from the sky to the ground without relying on a wireless signal. 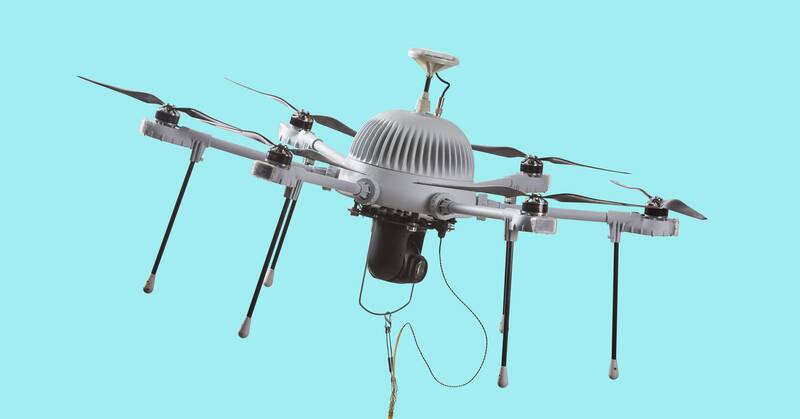 One big potential application for persistent, tethered drone technology is getting communications up and running in areas hit by natural disasters like hurricanes. (The FCC slammed Verizon after Hurricane Michael in Florida in last month, saying it didn’t restore service fast enough.) It’s the same thing Alphabet’s Project Loon wants to do with balloons touring the stratosphere, and that Facebook unsuccessfully explored with massive winged drones. CyPhy’s system, Major says, can be set up in just 10 minutes and comes in two suitcase-sized ground units. One contains all the electronics and needs a power supply (you can plug it in, or hook it to a generator if you’re off the grid). The other is the spooler, the computer-controlled winch that reels the tether in and out. The idea is to keep it just taut enough that there’s no extra cable flapping around or weighing the drone down, but not so short that it actually tugs on the drone putting extra tension on the line. Major says the company is looking at scaling up—customers always want to fly heavier payloads for more powerful radios and camera, or environmental sensors. It’s also looking at building a moving system, where the base station and spooler could be on the back of a vehicle, with the drone following behind on a leash. That should return some of the advantages of a traditional unhooked drone, but still allow all day data gathering for clients like insurance companies, without stops every 20 minutes for battery swaps, and proving that free flight isn’t all it’s cracked up to be. Sometimes it’s better to be tied to the ground.